Traditional Valentine’s treats are usually high in carbs. 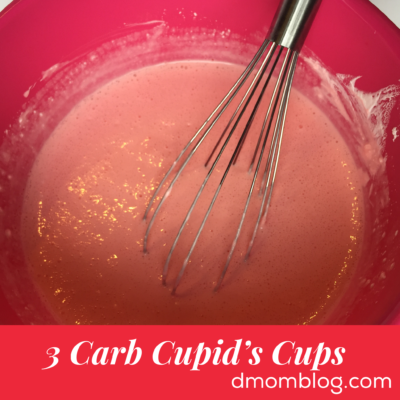 But here’s a quick dessert you can make for your sweetheart any time of year. And your child’s eyes will light up because she can actually lick the spoon as you are making these! If you want to get really fancy, decorate the cups with Valentine stickers or top them off with fresh strawberries or a few chocolate chips. Prepare the first box of jello using the quick set method: Dissolve Jell-O into 3/4 cup boiling water. Add ice cubes to 1/2 cup cold water to make 1 1/4 cup. Stir into jello mixture until dissolved. Pour into 8 6-oz. 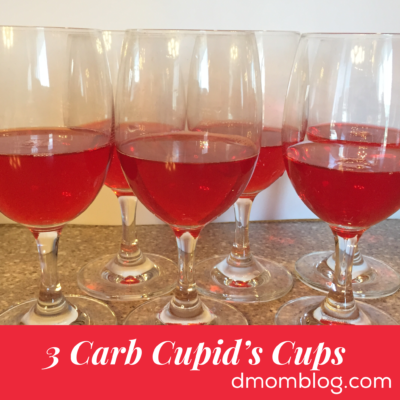 clear cups and refrigerate for 1 hour. After the cups have set one hour, prepare the second box of Jell-O using the same quick set method. Whisk in 1/2 container Cool Whip. Spoon into cups. Refrigerate 1-3 hours. Sugar-free JELL-O has no carbs. One-half container Cool Whip has 25 carbs. Each serving has 3 grams carbs. Since it’s under 5 grams carbs, it could be considered a free food. Sugar-Free Cool Whip actually has more carbs (3 carbs per 2 tbs) than Regular Cool Whip (2 carbs per 2 tbs). 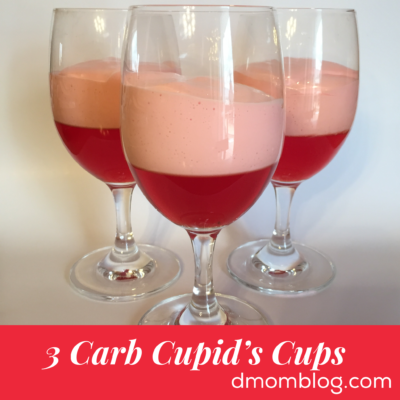 This recipe is adapted from Kraft Foods’ recipe for Cupid’s Cups. Gotta love the sugar-free jello and pudding! I’m surprised that Sugar-Free Cool Whip has more carbs than Regular Cool Whip . Good to know! Isn’t that strange? The ingredients list is completely different too. Yet they taste about the same. The marvels of modern science, right? Cool Whip has got to be one of the most artificial products out there! ours are in the fridge chilling now! thanks again! Yay! You’ll have to let us know how you like them. My daughter wants to make them with lemon next and I think it might taste like lemon cream pie. How many cups do you get from one batch? I’m thinking I’ll bring these in for Naomi’s class party tomorrow. 🙂 Thanks! BTW another low carb special treat around our home is a little cup of diet rootbeer and a couple spoonfulls of Cool Whip, it tastes a lot like ….a rootbeer float! Alissa- I usually do eight and it’s a generous portion. You could make them a little smaller probably.